Salt Spring Chamber Music Fest director David Visentin performs at the annual festival in a previous year. 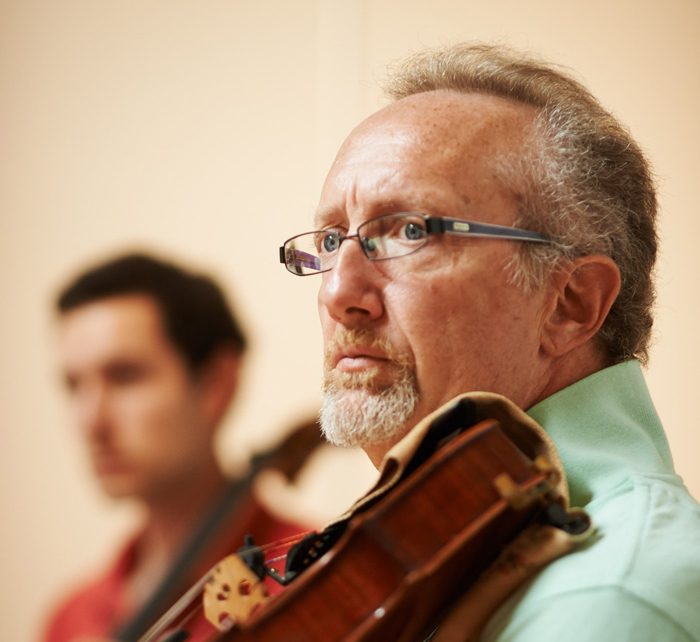 ArtSpring brings back its much-anticipated Salt Spring Chamber Music Fest this month. The 2018 event runs from Monday, July 23 through Saturday, July 28 and features gifted young artists and faculty musicians in three concerts. The young artists who participate in the Chamber Music Fest come from near and far across Canada for a week of intensive coaching on themed pieces, and they perform these works at the end of the week in public concerts starting July 26. This year Chamber Music Fest presents major works by composers in the chamber music repertoire including Dvořák, Martinu, Janácek, and Smetana as well as Novák, Suk, Franck, and Kodály. Among the highlights is ArtSpring’s executive and artistic director Cicela Månsson performing two of Dvořák’s Gypsy Songs at the July 28 Faculty concert. “Now into its 16th acclaimed year of west coast performances, the Salt Spring Chamber Music Festival (SSCMF) showcases an outstanding variety of the greatest works from the chamber music repertoire for loyal audiences, all performed on the intimate stage of ArtSpring,” said festival artistic director David Visentin. Faculty members coaching this year’s group of young artists are Visentin, viola, joined by Hiroko Kagawa, violin; Kai Gleusteen, violin; Catherine Ordronneau, piano; Simon MacDonald, violin; and Amy Laing, cello. The Salt Spring Chamber Music Fest concert series opens at 7:30 p.m. on Thursday, July 26 with the Chamber Music Fest Young Artists performing Vitezslav Novák’s Piano Quintet in a minor, Op.12. On Friday, July 27 at 7:30 p.m., the Young Artists perform Josef Suk’s Four Pieces for Violin and Piano, Op.17, César Franck’s Piano Quintet in F minor, Antonín Dvořák’s Terzetto in C for two violins and viola, and Zoltán Kodály’s Serenade for two violins and viola. The festival concludes on Saturday, July 28 at 7:30 p.m. (bar 6:30) with the esteemed faculty performing Sonatina for Piano and Violin by Dvořák, Three Madrigals for Violin and Viola by Martinů, two of Dvořák’s Gypsy Songs, String Quartet No. 1 “Kreutzer Sonata” by Janáček, Piano Quintet No. 2 in A major by Dvořák, and String Quartet in F major by Dvořák. Tickets are available online or through the ArtSpring box office. For more on this story, see the July 18, 2018 issue of the Gulf Islands Driftwood newspaper, or subscribe online.